I got a couple of these mp3 player boards off eBay recently. They were approx AUD $6.50 each posted. Deal Extreme also sell it. It has a stereo 3.5mm socket for the audio output which drove my headphones (120 Ohms impedance) to quite reasonable levels. The connections are very basic. 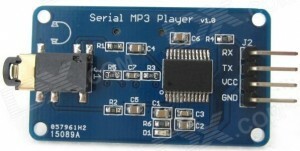 Rx: 3.3V or 5V serial input. The baud rate is 9600 8N1. 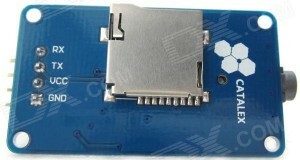 The rear of the board has a micro SD socket. You can use pretty much any micro SD card. I used a 32GB one for initial testing. You can format it as FAT16 or FAT32. The serial interface supports a reasonable number of commands, which are documented in the (Chinese) data sheet as well as in the code examples. These modules would be great for hobby projects and there are a few Arduino examples easily found with a Google search. BobNJ over on the Haunt Forum emailed me to say he got these modules to work in stand-alone and push button modes.